I may not have much (any?) good shopping where I live and there may not be many super great restaurants, but one thing we have plenty of is SNOW! I know I've probably mentioned it a couple million times, but I'm going to mention it again: I live in the 3rd snowiest city in the United States. This winter isn't looking so bad, only 87 inches so far (last year at this time we'd already gotten 140 or so!). 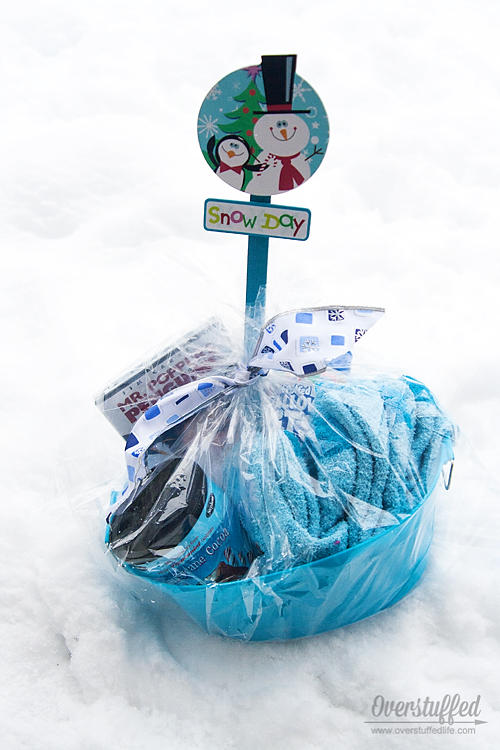 Still, we already had one snow day, and I'm pretty sure that there will be a few more, so I decided to make a few snow day survival kits for our friends. They were super simple to make, and best of all, not very expensive. I bought the cute blue tubs from Dollar Tree, obviously for a dollar apiece. I then filled up the tubs with batting and a few fun goodies. 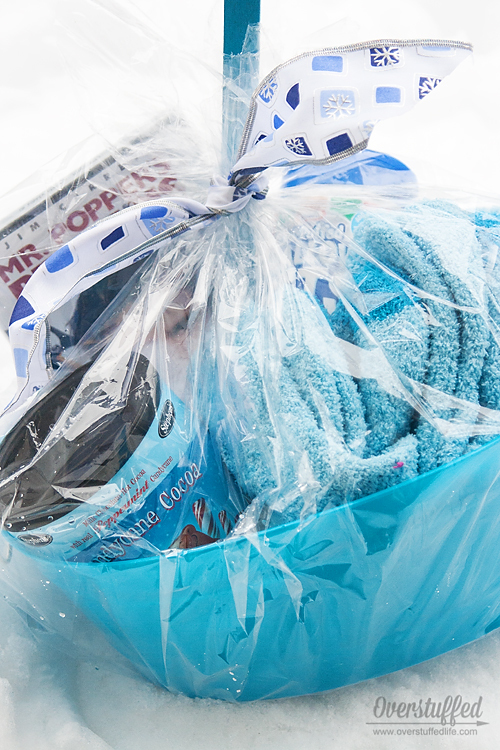 We put in our favorite hot chocolate: Stephens Candycane Cocoa. Because, what's a snow day without a good cup (or three) of hot chocolate? I put in a pair of fuzzy socks for each kid. I found some at WalMart that were blue and fuzzy with snowflakes on them. Perfect! Mr. Popper's Penguins, Happy Feet, and Happy Feet Two (many of these are actually even cheaper on Amazon, which are my affiliate links). I topped it off with a super cute little wooden decoration that I found at WalMart for under a dollar (okay, so my mom found them at WalMart for under a dollar, but they are super cute!). 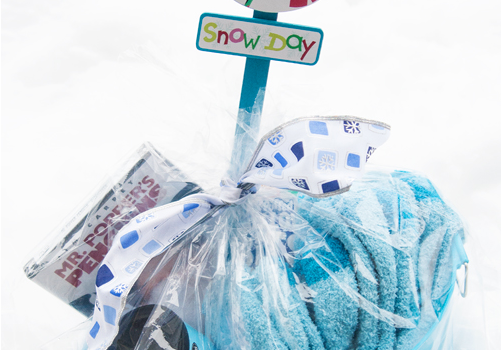 Even if you don't plan on having a lot of snow days, these are fun to put together and give away! 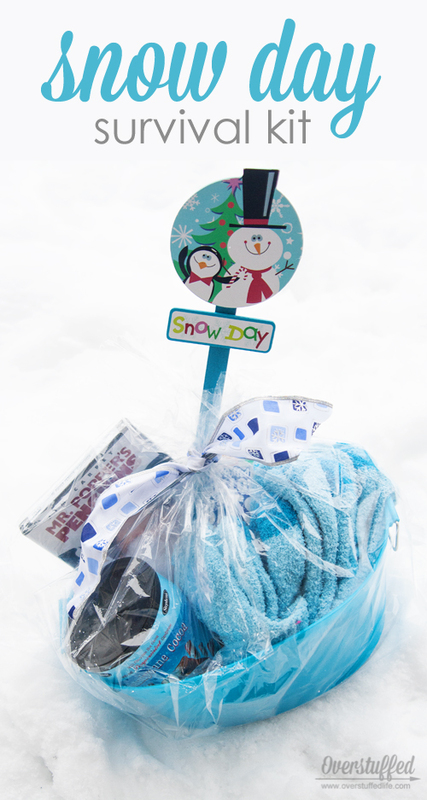 You can pretend to have a snow day! And its even color-coordinated! I've seen so many people with snow, both bloggers and Instagramers, and I'm over here with sunshine (though it is only 35!). I hate when it snows, because everyone goes crazy, as we don't get it often, but this would be perfect even just for a cold afternoon (or weekend!). Fun! When I was younger I always looked forward to snow days. Now I am just waiting for it to snow here. Which isn't likely but I will keep my fingers crossed. What a cute gift idea. I don't have much shopping close to me either, nor places to eat, and not nearly as much snow as you; but we did get snow several times this year so a snow day kit would be fun to make for the grands. Thanks for partying at For what it's worth-jeannie. I do hope it snows for you! You are welcome to some of mine! Snow day certainly means different things to different people in different places, that's for sure! I still look forward to them! I want more sunshine! :) I will happily trade with you.